Students, it’s pretty much your career from the time you start your first day of Kindergarten until at least your senior year of high school. Maybe even an extended career if you choose the path of higher education. 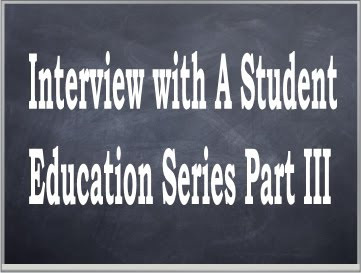 In today’s final interview in the education series we are talking to tenth grader Ian Flowers. To stop and listen to the opinions of those actually taking part in the education system is an important way to improve the system and better meet the needs of individual students. After all, education does ultimately effect the lives and the futures of the worlds young people. Question: What are your feelings about school in general (think about the whole process you have been through, not just your current grade)? Question: Do you think we are expecting too much out of the student body these days? In other words, are we forcing them to grow up too fast and robbing them of some of their childhood? Question: Are you for or against School uniforms and Why? Question: Should teachers be expected to have an identical dress code to the ones students are required to follow? Question: How involved do you think parents should be in the educational process? Question: What matters most to you about your education? Answer: Having the ability to go on to college, and getting a degree in your desired trait. Question: Where do you think the most focus should be when it comes to spending funds for education? Question: What are your thoughts on healthier school lunches? Answer: sounds good to me. Question: Do you participate in after school functions? If yes how important are they to you? Question: Do you think youth have changed over the years? If yes for better or worse? Answer: yes, but neither toward better, or worse, just, different. Question: Do you think the bad economy has an effect on a child's learning abilities? Question: What do you find most annoying about the education system? Answer: having to wake up so early. Question: How has technology changed your education? Answer: It has made it to where you can learn about virtually anything all from one spot. Question: What do you expect out yourself when it comes to your education? Question: What are your favorite subjects in school? Question: Do you think foreign language should be taught starting at a much younger age? Question: Do you have a big agenda planned out for your future, and does it involve higher education? I can't wait for my boy to be a teen and give me these kind of short answers. I enjoyed reading this. Thanks for sharing. Have a good one. What's Your Favorite Christmas Songs?? ?